If you would like to trade, shoot me an offer. Realize that I am part gamer and part collector, so please do not expect me to give away my best cards for nothing. I will rate high on trades regardless of the offer, but dont take advantage, as multiple trades receive consecutively lower ratings. That being said, I will always be happy to help new people out with some cards, let me know in the trade comments that you read this site, and ill try to hook you up as best I can. No guarantees, but I love helping people out. Send me a same card trade if you have a gameplay question or would like advice. 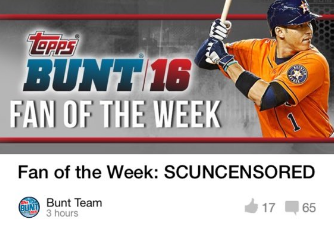 I have been VERY active on both of the main Topps digital games, and I love to bring new people into the game. I am new at this. I have found this site to be very informative and helpful. Thank you! I still have to figure out the trading game. This site has been a tremendous help and I enjoy checking in each day for your tips, plays of the day,etc. Keep up the great work! Pardon the “stupid” question but when you refer to Series 1, Series 2, etc. What exactly are you talking about? Obviously, I’m new to this but I LOVE this APP! Is there a trading card primer somewhere that I could review? Mainly focusing on collecting right now but I do look at the line up and play a pretty good set of cards each day. If I taught Business at a university, I would have a whole semester of just playing this game. Putting together good transactions that are beneficial to both parties, negotiating, etc are all over this game. Series one are all the cards that were released in real life under Topps Series One Baseball. Series two is the same. Think of it – cards that were on the app to begin with from day one and those released later on. You can tell which is which by how many cards exist. Most of the series two golds are still pretty rare. Thank you so much for this website. I really appreciate it. I added you as a friend, I hope that is ok. Some guy keeps making me trade offers for a TBT Dale Murphy card I have that he really wants. He offered a Tanaka silver, and then like 4 silver yankees when I rejected Tanaka. I looked at his collection to see what he has, and above his “Limited” cards he had a “Not For Sale” section with 3 cards that said “Coming Soon” – a Rod Carew (Twins), a Tony Gwynn 1960-2014 memorial card and one other. How did he get cards that aren’t even obtainable in packs yet? And what’s the difference between a card that is “Limited”/”Sold Out” and one that is “Not for Sale”/”Sold Out”? How long is a person considered a rookie. I ask because it seems like the rookie packs of 3, 5 ,7 cards were a good value because of the percentage chance of getting super rare cards. I just hit PTS level 2 and those packs are no longer available for me to purchase. Should I have been more aggressive in buying those packs? Could just be that the packs were taken out of the store for everyone. Happens all the time. Doesnt necessarily mean your profile changed, but Im not sure. Love this site and the app. I will be adding you as a friend tonight. My name is OBI-WAN-JACOBY in the game. I will send you some trades tonight with a note. Keep up the great work on this site! This is a great read, thanks for sharing so much info. I added u to my friend list in Bunt…delegated u by accident but sent another request. Joined exactly a week ago and am really enjoying playing and collecting. HI. I just wanted to say thank you for all the helpful info I was able to get from reading your articles . I’m new to playing Huddle this is my 2nd week and I’m still learning the game and my biggest thing is learning how to offer trades . As I notice in my first week i would receive some crazy trades for certain inserts i had . As I am new still learning what each Digital Card Value will be . BUT I wanted to say thanks for having these different articles I was able to learn what is Digital cards are good to chase . I look forward to reading more . @Deltapi1049 – what is the best way to receive the special inserts? Do you spend the coins on the backs or the bundles? I.e. – I’ve saved up money to get the deck builder premium in Bunt, as a newer player, and I love those packs because they contain so many cards. However, I feel as if in those, you don’t (and aren’t supposed to) get any of the inserts. Is it better to buy those special packs as opposed to the deck builder packs? Same question applies for Huddle as well I suppose. Noon here.. Just added you on Topps Bunt 2015…wanting more information on the cards themselves. I see green cards and then I see a green looking card with 2 dots on the side… How can I learn more about the different types of cards I’m supposed to be collecting.? Cameron, read the news for each insert you are interested in, as that news will explain what packs contain those inserts. Obviously, the packs named for the insert are where you find those inserts (recent example being Super Heroes). Seventh Inning Stretch and Payoff Pitch carry many of the regular inserts (Editors Choice, etc). Seventh Inning Stretch is costly at 40,000 coins, but is 25,000 for paying fans. I have found Payoff Pitch packs to be nice, as there are usually a few different inserts you can pull from them. If you are on a budget, you cannot chase all the inserts. Pick a few or even just one set at a time and work on it. Hi my huddle name is bazookaface and my bunt name is bazookaface1. Love the site, I’m trying to collect my base huddle set and some Chase inserts, on bunt I’m trying to get high scoring cards and rank up everyday. I’m lucky that I’m doing well in contests, I’m a point chased and I’ve finished 12th my second weekend.